Little Gull - White Rock Lake, Dallas Co., February 14, 2016. 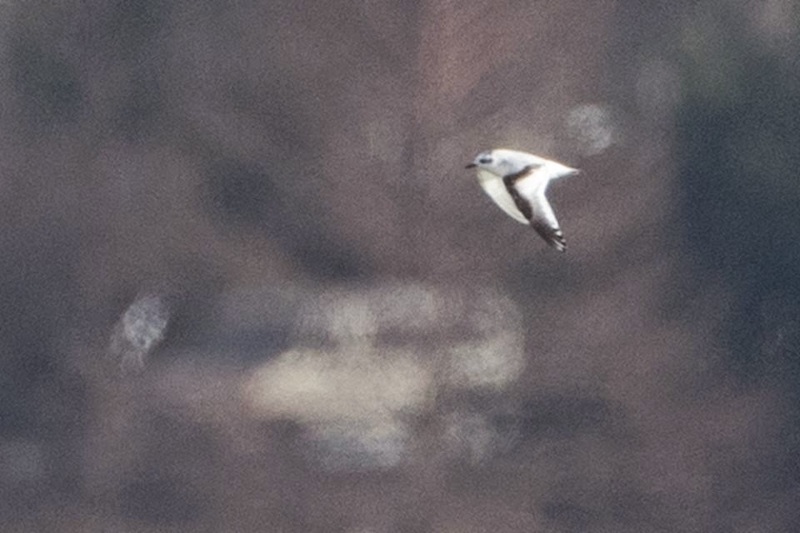 Flying below Bonaparte's Gull. 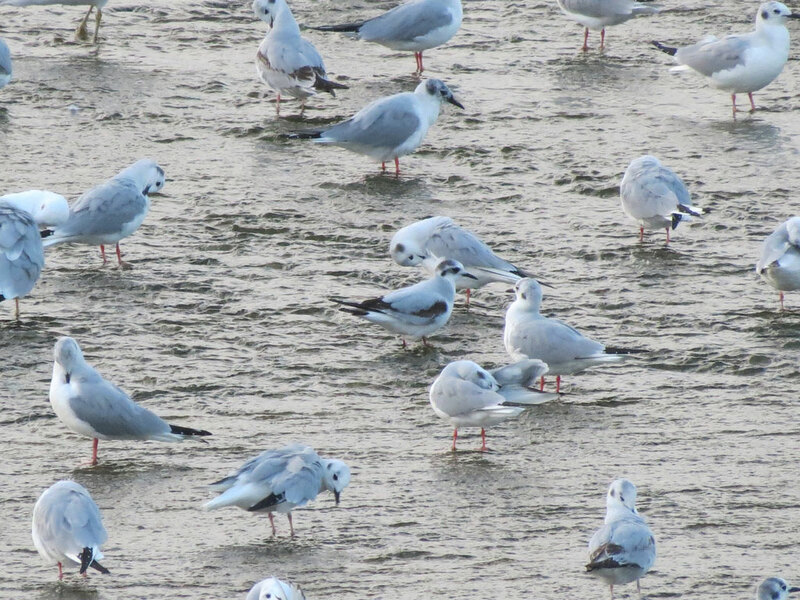 This Little Gull picture - with two Bonaparte's Gulls - was taken by Thomas Riecke on March 6, 2006 at the White Rock Lake spillway in Dallas County. Notice the uneven dark smudging on the crown, smaller neck, beak, and overall size. Recently taken off the Texas Review Species List as of September 2012. Little Gull - One adult was at Lake Ray Hubbard, Dallas on 25 November 1990 (BG, PB; 1990-146). 6-21 March 1992 (JWS, CH; 1992-43, TPRF #1102). (RA, NA, RRa, MAu; 1993-23). Little Gull - One adult at White Rock Lake, Dallas, on 2 December 1995(KR; 1996-49). Little Gull - One at Lake Arlington, Tarrant, on 15-16 March 1996 (CH; 1996-46). 1999 (MR,ShC, JWS, JMc, GL, BFr, EC; 1999-97; TPRF 1755). 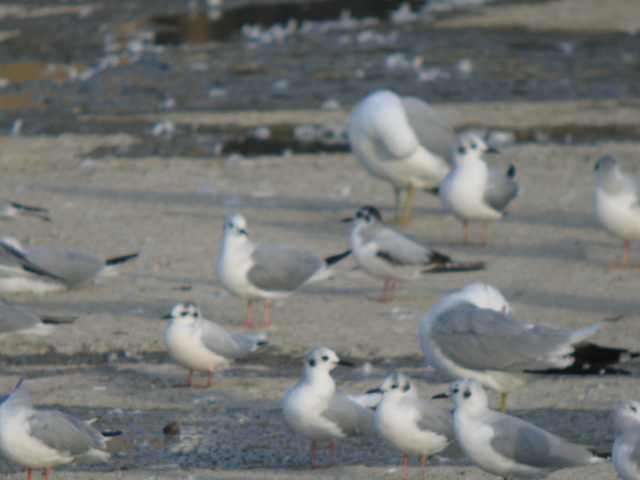 Little Gull - One at Lake Worth, Tarrant,from 18-19 November 2001 (JMc, MR; 2002-2). Little Gull - One adult at Lake Ray Hubbard, Dallas on 11 November 2005 (BG; 2005-130; TPRF 2355). Little Gull - One adult at Lake Ray Hubbard and White Rock Lake, Dallas. from 23-27 February 2006 (BG,DDC, TR; 2006-26; TPRF 2376). Little Gull - Two at White Rock Lake, Dallas, from 28 December 2006-19 March 2007 (BG, MR; 2007-04; TPRF 2465). 2007-95; TPRF 2526). Little Gull - One adult at Lake Lavon, Collin, on 26 December 2007 (GB; 2007-100). (CR, LHo; 2009-102; TPRF 2785).